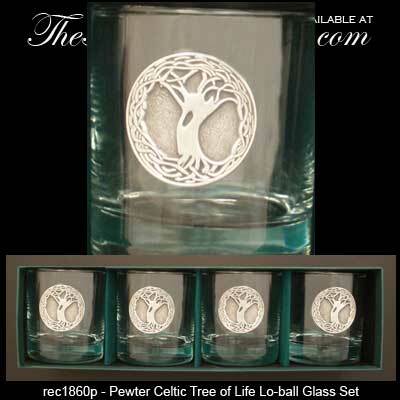 Irish whiskey glasses features pewter Tree of Life emblems that are enhanced with Celtic knots. It’s branches reach in search of learning and knowledge. This set of Irish whiskey glasses features pewter emblems with the Tree of Life along with Celtic knot-work accenting. The Tree of Life whiskey glasses are dishwasher safe and are made in the United States. The Irish lowball glasses hold 10 ounces of whiskey and are gift boxed with Tree of Life and Celtic knot history cards, complements of The Irish Gift House. Irish whiskey glasses feature gold plated over pewter Tree of Life emblems that are enhanced with Celtic knots. Celtic whiskey glasses features copper emblems with knot-work. This Irish whiskey glass style is also called lowball or double old fashioned. Irish whiskey glasses are a premium set that features pewter emblems with Celtic knots. This Celtic whiskey glass is also known as lowball or double old fashioned.